We started today pretty slowly with Mark planning and booking his transfer to Almeria when he heads south and I go back to Paris then home. He’s meeting a friend and they’re sailing in the Mediterranean for a couple of weeks. Packing up, checking out, then getting lost (ish) came next. We had to ask in a bar where the Europcar depot was. I had a good chat with the barman who seemed quite impressed that we came from Nouvelle Zealande. “So far” he said. He then came outside and pointed us back the way we had come, the depot was above the exit we had come out of the station through. Duh! So we’re driving a Citroen C3 with 800km on the clock. I elected myself first driver because I have the most experience driving in Europe and we headed for Cap Ferret because Mark liked the name. It’s on the Atlantic coast and a surfing and holiday resort, a bit like Waikuku but with more beaches, higher dunes and more restaurants. 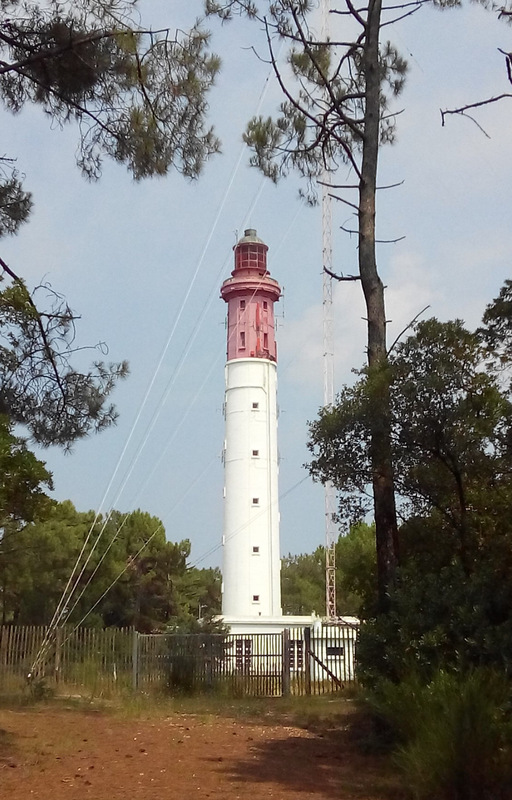 Mark climbed the lighthouse (pic above) but 258 steps felt a bit serious for Quilliam at present. It was after 2pm by now but we found a seat under a yellow umbrella at a restaurant and settled down for a, full menu, three course lunch. Mark had the oyster entree, Quilliam had the grilled camembert with Cranberries. We both had the fish with peppers and dessert was a strawberry tiramisu for Mark and raspberry with yoghurt for Quilliam. Excellent! Next came a swim in the Atlantic for Mark but I just got to the top of the sand dune and watched because of the steep, long descent to the beach in soft sand. We’re booking hotels one night ahead on the internet, it’s easy, cheap, and we know we’ve got somewhere to stay organised. Tonight we are in Mont-de-Marsan which was probably a bit too far to drive but we declared it another good day. I am enjoying reading your latest Quilliam, sounds like you are doing very well, thinking of you this afternoon while I walked on the beach at Waikuku with the grandies! Hi Quilliam & Mark, Just a quick note before we go on our Sunday drive in the sun! good to catch up with your daily trips. And we enjoyed your photos and the sketch. Keep in touch.